How to Apply for Junior & Senior Fellowships to Outstanding Persons In the Field Of Culture 2018. 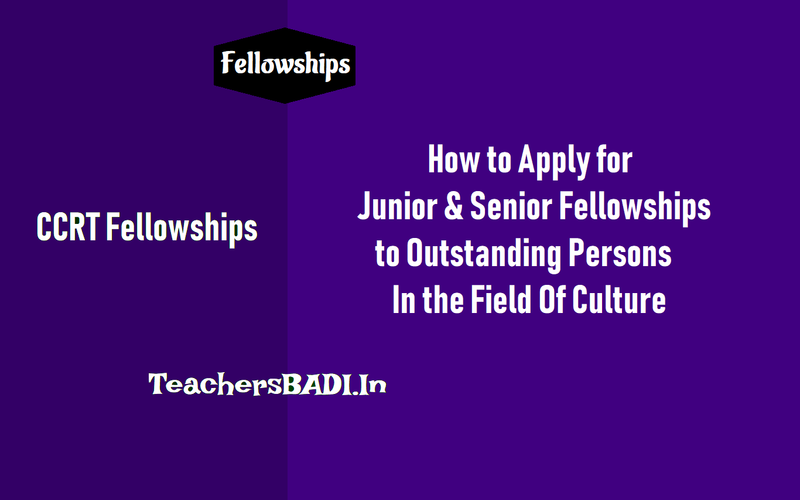 Scheme For The Award Of Junior & Senior Fellowship To Outstanding Persons In The Field Of Culture: Calling applications under Sr/Jr Fellowships to outstanding persons for cultural research. Online Applications are invited by CCRT, Ministry of Culture, Govt. of India for the award of Junior and Senior Fellowship for undertaking research oriented projects in the field of Performing, Literary, Plastic Arts and New Areas related to Culture. Applications are invited for the year 2018-2019 with effect from 17th September, 2018. There are 200 Junior & 200 Senior Fellowships for this year. Details of the schemes, instructions for applicants, eligibility conditions/criteria and Application Module are available on the following websites of the Ministry of Culture Government of India and CCRT. Step 2: Click on MOC Schemes Application. Step 3: Click on Registration. Step 6: Go to current scheme status. Step 7: Click on the appropriate Scheme. Step 8: Fill up the form and submit.